As we celebrate its 31st year, it is only fitting that we should reflect on the huge success of the competition. 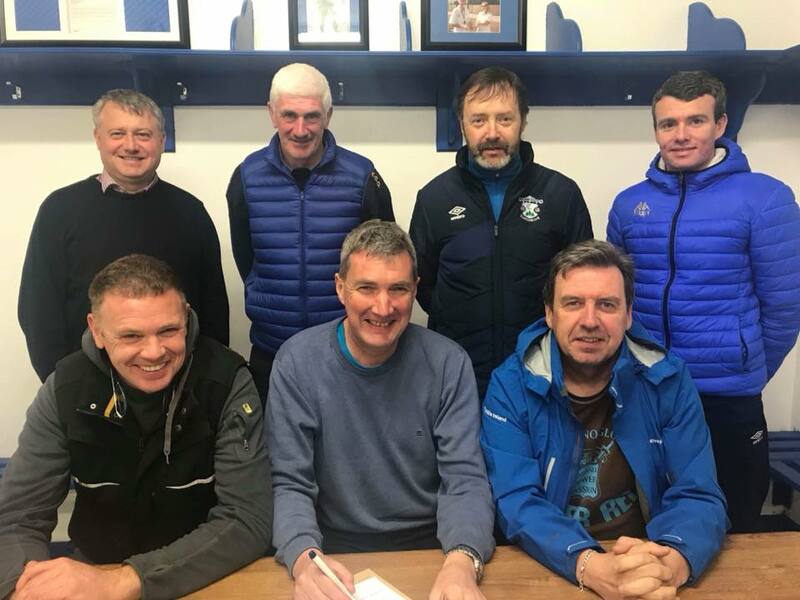 It is no overstatement to say that the tournament has been the greatest promoter of soccer in Killarney and beyond over the past three decades, with the roots of a number of clubs in the area stemming from the 7-a-side. The club ran the first 7-a-side with two objectives, firstly to promote and encourage participation of the game and also to contribute a portion of the revenue raised to local charities. There were 19 senior men’s teams in the first year with an Athletic flavoured Bounty Boys team narrowly defeating a Killarney Albion team that would form the base for the emergence of Killarney Celtic in 1978 after amalgamating with Killarney Rangers. Mastergeeha, Ballyhar Dynamos and Inter Kenmare were also Clubs to have emerged from competing 7-aside side teams in the late 70’s and 80’s. The outstanding success of the first year indicated that the 7-a-side was destined to prosper. 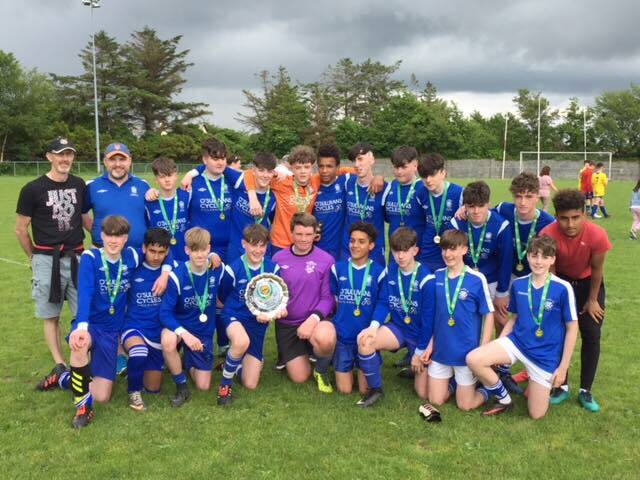 The critical element for success, of course, was the venue of the Aras-Padraig pitch that hosted the tournament for the following 23 years, and became a recruiting ground for clubs in search of soccer talent. With its growth in popularity, it attracted not only teams from the town but also from wider a field. Names like, The Kentucky Reds, The Laurels, The Carpet Baggers, and a team from Scartaglin were just a flavour of the teams in the earlier years. Millstreet became the first ‘out of town’ team to win in the late 70’s and completed a double the following year. Lynes Tavern were also to the fore back in the 80’s winning in ’82 with an Athletic/ Celtic mix, and in ‘83 with a number of very good Tralee Dynamos players in their line up, a Callinafercy side dethroned them. In the ’85 decider, the Killarney Hardware side of Tom “Sossy” Mullins R.I.P. battled back from a four goal deficit to record the most incredible victory and went on to make it back to back wins in ’86. The wizardry of present Kerry team boss Pat O Shea and the goal-scoring prowess of Gerry Mc Gowan lit up the stage over that period. The final stages of the competition were by in large being dominated by club teams with the Celtic based teams of Haircut 100 and The Failte to the fore for a number of years, with the Dr. Crokes based Tatler sides also proving worthy contenders. However in many ways the real success of the tournament was not ingrained in the final stages but in the earlier rounds with many teams getting great enjoyment from the sheer annual wearing of the boots and participation with their friends or work colleagues. This important façade of the tournament was recognised by the organisers in 1984 when The Reserve Cup was introduced, giving the ‘less loaded’ teams a chance of being around for the latter stages of the competition. There were many fun teams at the time, one notable one was aptly named ‘Teddy’s Wipeouts’ with some well known ‘retired’ local players providing great entertainment for the crowd. A family team of the O’ Leary Brothers also deserve mention, as do a team named the ‘Wibbly Wobbly Wonders’ who keenly contested every year. The success of the under-age 7-a-side, which also started in the late 70’s, was also paying dividends, ensuring there was a conveyer system for players through the ages to senior level. The early 90’s saw a significant increase in the number of teams entering, this was due in large to the euphoria and success of the Irish International team during a period that became known as the ‘Jack Charlton era’. Another important addition at that time was the start of the ladies 7-a-side with one particular team standing out; they were Mary Joe Curran’s All-Star Ladies team and boasted no less than 30 All-Ireland Gaelic Football medals between them. When the club purchased its own ground in Woodlawn in 93’ it did so with the help of funds raised from previous 7-a-sides, which by now had become the primary fund-raiser for the club. 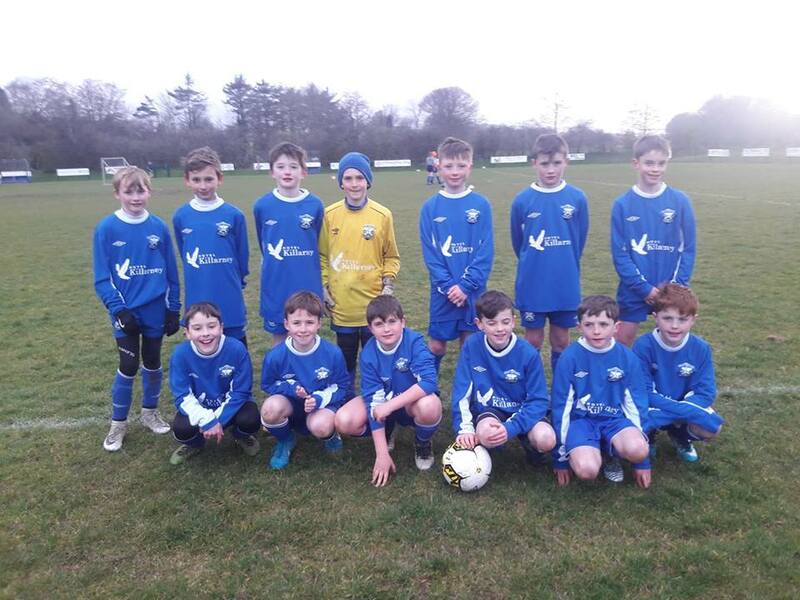 Coupled with this, we benefited enormously from the local Sports Minister John O’ Donoghue through National Lottery funding, which has aided the club’s ongoing development plans. The dynamic Vince Casey was commissioned to run the tournament from 1993, with the aim of making it even more professionally run so as to maximise the participation level, the entertainment level, and the sponsorship level which in turn has assisted our ability to progress our plans for the future. The club’s foresight was rewarded in 1999 when the tournament moved from the much beloved Aras-Padraig venue to Woodlawn. Some felt at the time that the move would kill the tournament, and most certainly, the entertainment that the Aras venue provided could never be replaced. However, with two enclosed pitches, adequate parking and a modern changing room facility, the 7-a-side continued to prosper. Again this year we will have over 1,100 players competing in the ladies, men’s, over 35’s, and underage competitions. When redevelopment work commenced on the Woodlawn pitches after the end of last year’s 7-aside, there was a faint hope that it would be ready for this year’s event, but due to the extent of the work and weather conditions, the pitches will not now be reopened until later in the year. 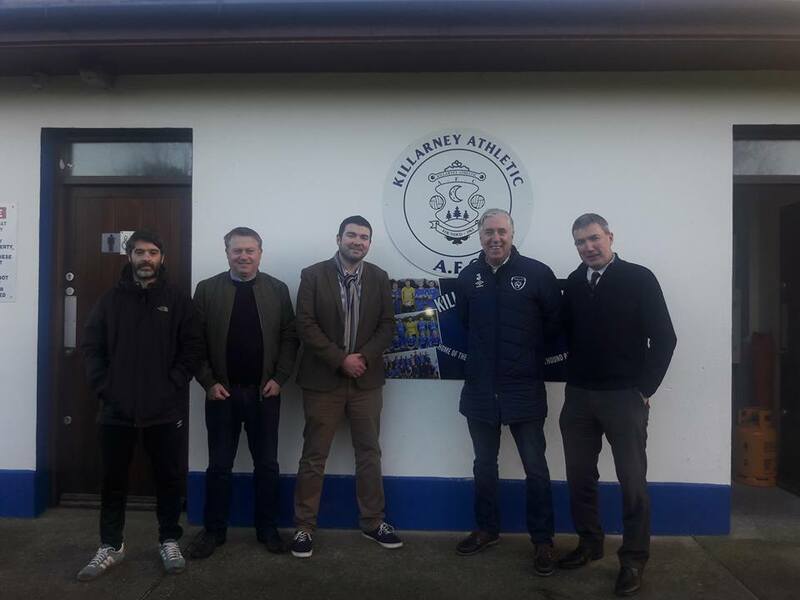 Undeterred, the club was delighted to be provided with a fantastic alternative venue in New Road for this year’s event, all thanks to Pat Favier and the Killarney Community College. These past number of years the Premier Cup has had different winners with club based teams from the Dynamos, Celtic and Athletic taking the top prize while the Reserve Cup continues to be the coveted prize for many participating teams. The number of teams in the Ladies Cup competition most certainly could do with a boost of encouragement, while the over 35’s is likely to become even more popular with many former players of the senior competition now reaching the ‘Autumn’ of their playing days. As for the under-age tournament it has been said that youth is the blood line of sport and I’m sure with encouragement the young players of today will be the senior players of tomorrow’s 7-a-sides. 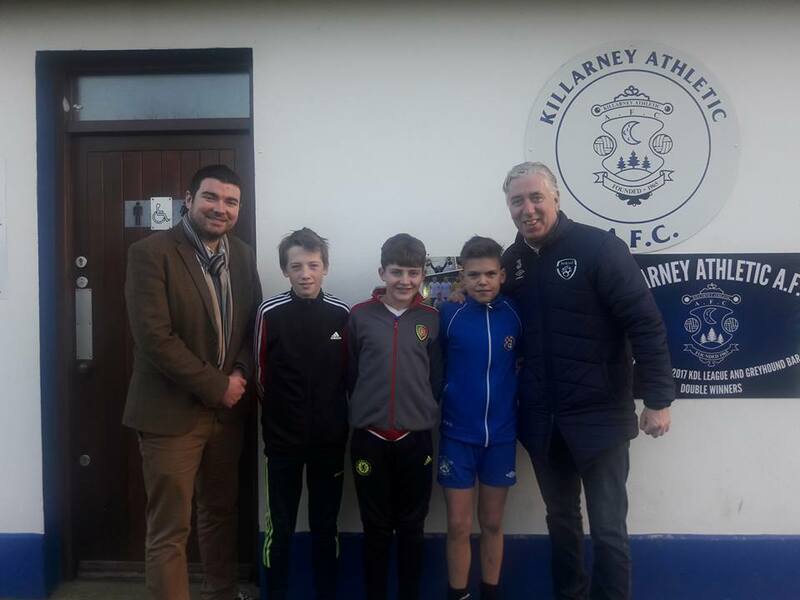 A worthy mention should also go to Killarney Athletics’ two pro players’ Diarmuid O’ Carroll and Brendan Moloney with Glasgow Celtic and Nottingham Forest respectively who made their first competitive debuts in the underage 7-aside. 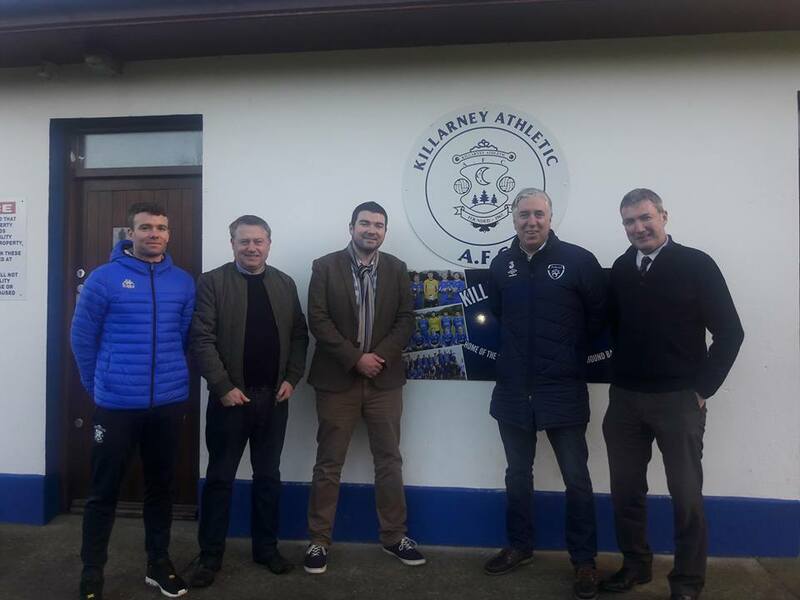 In conclusion, I wish to express a general thanks on behalf of Killarney Athletic A.F.C.to everyone who has contributed to making the 7-a-side such a success for the past 30 years and hope it will continue to entertain and give pleasure for many years to come. Thanks to the Kerry District League and the M.F.A. for their continued support. 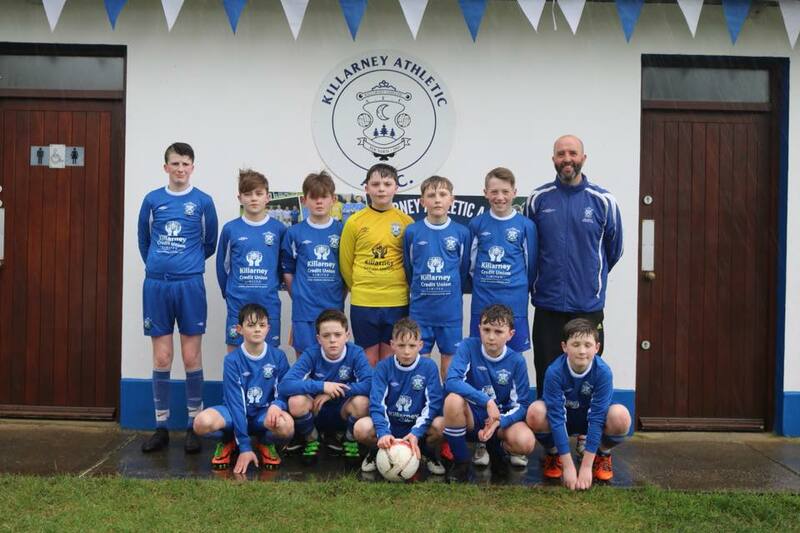 A special acknowledgement of thanks to our main sponsors Killarney Credit Union who have been associated with the tournament since 1999 and also to the following: Fr.Vivian Molloy R.I.P. and the Franciscan Community; all our sponsors and especially our Main sponsors over the 30 years, namely Con O’ Leary (The Laurels), Maurice O’ Donoghue R.I.P. (Gleneagle Hotel), Sean Leo O’ Sullivan R.I.P. (Auctioneer), Sean Murphy (Murphy’s Bar), Murphy’s Brewery Ireland (Heineken), Jimmy Fleming and Denis Murphy (Coca Cola), The Kingdom and John Bowler. A sincere thanks to the local media for their great exposure of the tournament over the years with a special mention for The Killarney Advertiser, Michelle Cooper Galvin (The Kerryman), John O’ Mahony (The Kingdom), The Killarney Outlook, Kerry’s Eye and Radio Kerry for their coverage, not forgetting Eamon Keogh (MacMonagle) for his outstanding commitment over the years. And finally, a big thank you to all who have participated as players, managers, supporters and particularly all our referees and numerous club officials for making the 7-a-side over the past three decades not just a club event but also a Real Community Event. Monday night’s opening action consisted of 14 games and the old reliables came out on top, with a few new teams to watch out for. Haircut 100, Leanes, The Amusement Park and The Shanty Masterbeaters were the pick of the crop, all putting up big scores. Charlie Foleys, Vincent Casey Life and Pensions, Tim O’Brien Furniture, Murphy’s Cripples and Valdas Tiling all look promising. Goals of the night came from Damien Moynihan who hit two for Murphy’s Cripples, Danny MacAlure for Tim O’Brien, who has shown some hidden talents, Sarunas for Valdas Tiling, Farouk for Killarney Golden Wheel, Timmy Fitz for the Shanty and a cracker from veteran Darren Gaffee. Welcome on board to new referee Simon Drághici and of course to the Templemans, Tom and Stuart. Things are hotting up now for the knockout stages and last night’s action saw comprehensive wins for holders Charlie’s Angels, The Speakeasy and dark horses Valdas Tiling. Charlie’s were never troubled despite doing without the injured John O’Donghue. Valdas Tiling is a team to watch with some quality marksmen, particulary Robertas who can’t miss at the moment. 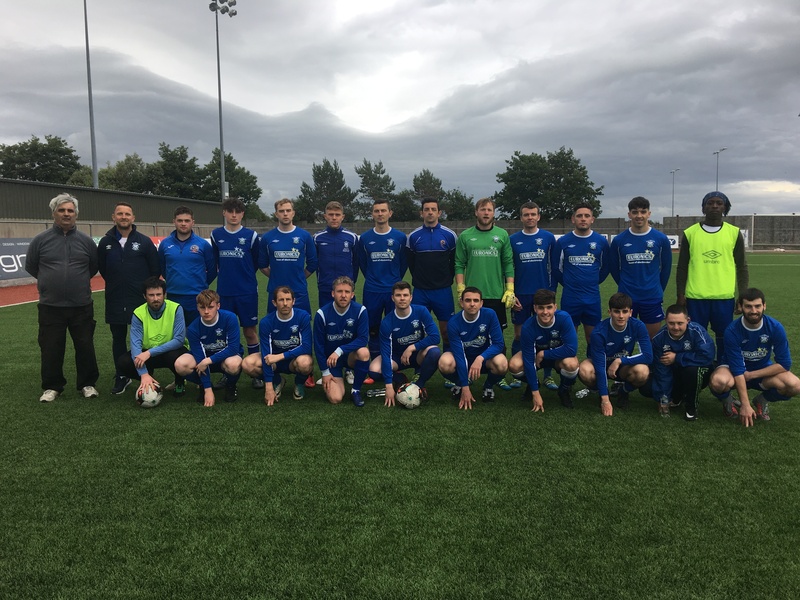 Teams such as Vince Casey Life and Pensions who had a 1-0 win over Murphy’s Cripples (Shane O’Neill hit a cracker from 25 yards) and A to B Rentals (2-0 v Tim O’Brien Fitted Furniture, Mark Harmon was on form) also look likely candidates for the Premier competition. The previous night saw a number of draws including The Laune and Falveys , Brian James (for whom veterans Seán O’Donoghue and Alan O’Connor starred) and Scatman Rovers. Haircut 100 and Leanes are looking increasingly good value for money and Dave’s Taxis are back on track after a 2-1 win over Sheahans’ Builders. The action gets under way again on Monday night at 6.45 and we’ll have a better picture of what’s in store or the knockout stages by then. Brian James scraped home with a 2-1 win over Scarlet Ribbon. 1-0 down early on, Kieran O’Neill and Toirdealbhach Ó Lionáird got off the mark to secure the win. Colin Moynihan had to be at his best to keep the Scarlet ribbon boys out however. Holders Charlies Angels had a clear cut 1-0 win, John B. Ó Donoghue chipping in a nice assist to young Fitzgerald. One of the favourites, Haircut 100 were two to the good v a 6 man Shanty side. Gary Keane and John McDonagh were the scorers. The Dromhall had veteran Shane Kelly at the end of a number of trademark runs into the box but could only get the one v Los Galiacticos. Davis O’Donovan hit the winner from 20 yards to rival the best goals of the night. Conditions were poor enough last evening after some torrential rain but there was still quality to behold across the board. After a comprehensive loss to Leanes, the Amusement Park bounced back strongly with a 3-2 win over Dave’s Taxis. Peter McCarthy hit two, one after beating four players on his way to goal. Joey O’Connor got the other. Favourites Leanes clocked up another big win, 6-1 v Sheahans Builders. David Gleeson got a hat trick, Paudie O’Connor got two and Sean Fagan chipped in with one. Frank McCarthy got the consolation goal for Sheahans. The Laune had a 2-0 victory over Kissanes Decorators, veteran strikers Enda Prendergast (with a nut meg of the keeper) and Mick O’Connell getting off the mark. More action tonight and we are hoping to maybe get a glimpse of the FAI entourage at some stage. The draw for the second round takes place tonight in Mustang Sallys at 9.30pm. All qualifying teams should have a representative in attendance. Last night’s action was spiced up when Steve Staunton, Packie Bonner and John Delaney arrived on the scene. It’s not known if they made any approaches but the quality was there to be seen! Brian James came out on top versus a gallant Mackey’s Crew. Valdas Tiling were clinical in despatching The Granary. Scarlet Ribbon progressed to the next round of the reserve. They are joined by Los Galacticos, the Dromhall boys,Zalgiris, the Lithuanian team who progressed with steady improvement, Mustangs and the fancied Daves Taxis. 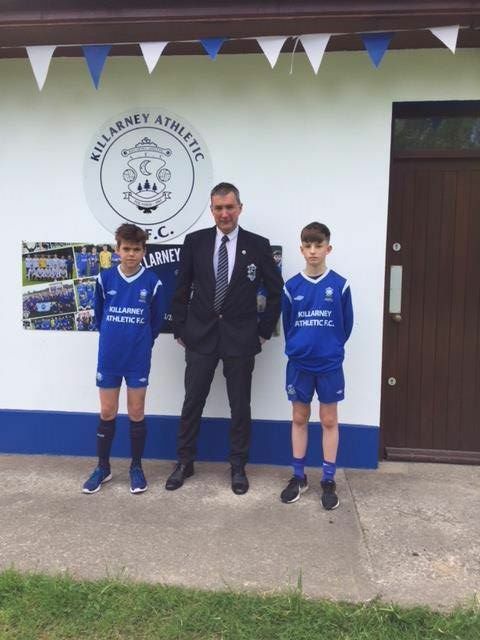 The draw made by John Delaney in Mustang Sallys last night was a great success and produced some exciting encounters, the all Athletic bout between the Laune and Leanes possibly the pick of the lot. No doubt it will be a vocal affair! Last night’s action was the beginning of the end for some teams as we reached the knockout stages. Home FC were first to get off the mark. Then The Tatler had the edge over the Schatmen courtesy of a typical Neil Kelders strike from 25 yards. Isuzi Troopers came out on top by 4-2 after penalties in the first of three very tight games. Vadlas Tiling kept their winning form going with a fine solo effort in extra time from Robertas. Another game to go the distance was Sizzling Rashers and Murphy’s Boulteens. Aidan Scannell and Gerard O’Sullivan got the goals and it ended up 4-3 on penos to Boulteens after a fairly “vigorous” game. Charlie’s Angels had too much for the Bridge Bar, John Doyle and Adrian O’Shea were on target here. Denis Galvin finished off a sweeping move to give Leanes entry to the next round. The Laune were always on their tail but despite the best efforts of Mark Griffin and Co., they couldn’t get the better of a fancied Leanes side. The Speakeasy looked good and progressed easily with Rory O’Sullivan on fire. There were two ladies’ games to finish off. Club Vitae were too strong for The Malton, Cassandra Buckley hitting two here. The Dromhall went down 2-1 to a persistent Pages Book Shop. More premier action tonight with Monday night’s postponed games taking place. Reserve action will now take place on Thursday. There were plenty of close calls in last night’s games with many games being won by the single goal. Haircut 100 (Pa McGrath), Brian James (golden goal in extra time from Kieran O’Neill), Moriarty Photos over A to B Rentals and Corkerys over Tim O’Briens (Alan Moynihan got the winner for a 3-2 win in extra time) all went through courtesy of a single goal victory. Buckleys eventually got the better of the Amusement Park after a marathon penalty shootout. Kingdom News were good value for their 5-1 win over Pure Craic and the Shanty were always in control versus the Horny Devils(2-1), Timmy Fitz still in good scoring form. Over 35 action saw two draws: Jades drew 1-1 with Mackey’s and Vince Casey drew 0-0 with Country Pork. Roger O’Sulllivan and Diarmuid O’Carroll were the crowd pleasers here. The reserve cup was the main attraction last night and it proved as tightly contested as the premier the night before. 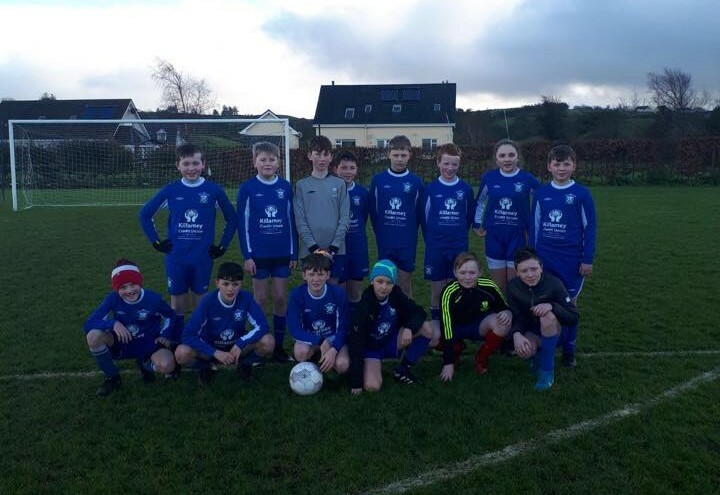 Kissane Decorators had a 1-0 win over the Dromhall. Omega Furniture came out on top against Killarney Ave.at the golden goal stage, Alfie Giles was one to watch here. Bluebell Photo and Kerry Satellite went all the way to penalties with Aaron Quill in superb form. Bluebell were victorious. Mc Sorley’s and Coca Cola also went to penos after a 1-1 draw but the McSorleys boys came out the best in this one. In the over 35 action, Mackeys Crew were two to the good over the Beaufort Bar. Eugene Bowler stood out here and scored into the bargain. The underage action begins tonight at 6pm and continues until 2pm on Saturday. On Monday night we reached the critical last 16 stage in the Premier, with two Reserve games up for decision. The first reserve game saw Beaufort come through after Damien O’Brien scored an unfortunate o.g. in extra time. Daves Taxis beat Los Galacticos 2-0 with goals from Timmy Lyne and Ian Lynch. The other reserve ¼’s were on Tuesday. There was one ladies game and Dromhall came out on top versus Sheilas Wheels on a 2-0 score line. The Premier saw the eagerly awaited clash of the Tatler and Leanes. This game went all the way to penalties with Leanes claiming the honours. The tattler can count themselves unlucky, having been on top for long spells with good performances from brothers Shane and Jamie Doolan. 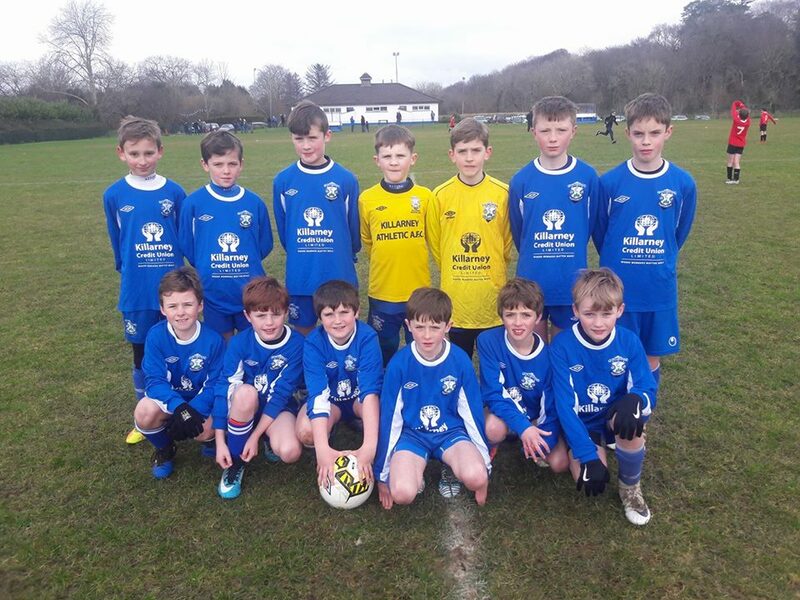 Leanes will face Charlies Angels who defeated Moriarty P 3-0. a header from Alan Nagle and goals from John O’Donohgue and Donal O’Connell. Another hot team are Haircut 100 who had a 1-0 win over Corkerys on a 1-0 score line, Kenneth Clifford got the winner from a free kick. Izusi troopers beat Shinnagh Star 2-0. Valdas put paid to the hopes of the Speakeasy with a 2-1 win. Sarunas was on form with a brace, while Donal O’Sullivan scored for the Speak. Home FC got the better of the Shanty, while Murphys Boolteens had a 1-0 win over an aging Brian James side! Tuesday’s action saw The Granary, Beaufort and Bluebell Photo progress to the semis on Thursday. All got through by way of the dreaded penalty kicks. Daves Taxis joined them there the previous night. In the Ladies, there were big wins for Charlies and Pages, 6-0 and 4-0 respectively. On Wednesday night we had the Premier ¼ Finals and some real action. In the only game left over from the last 16, the experienced Kingdom News were beaten by the youth of Buckleys with Chris Leahy Hartnett getting the winner. Buckleys face Isuzi in the ¼’s tonight. Home F.C. went down 1-0 to an improving Murphy’s Boolteens. Last year’s winners Charlies Angels exited thanks to the efforts of Nicholas Murphy who scored one and had a free kick deflected into the net by a Charlie’s player. Alan Nagle got one back for Charlies but even the guile of John B. O’ Donoghue couldn’t save them this time. The last ¼ was a controversial one but Haircut go through after 2-1 win over Valdas Tiling. In the Ladies, Charlies had a 4-0 win over The Dromhall, Edel O’Carroll getting among the scorers. Pages kept up their winning form with a 1-0 win over Club Vitae. Tonight we’ll have the Reserve and O35 semi finals, along with the one remaining Premier ¼ final. The action kicks off at 6.45pm. The Beaufort Bar and Vince Casey Life and Pensions made it through to the final of the O35 competition after a couple of cliff hangers. Vince Casey took the lead through Donncha Galvin after a Ger O’ Shea free kick and looked like winners for a long time. Eamon Bowler got the equaliser for Maccies Crew in the second half and the teams couldn’t be separated in extra time. Peter O’Brien saved the first peno and it was down to Don Fennell to send Caseys into the decider. The Beaufort Bar and Murphy Motors also went the distance. Tom Hickey kept his side in it with some great saves but Cormac O’Shea eventually gave Beaufort the lead. Dermot O’Meara got the equaliser for Murphys and subsequently hit the post. Then in extra time, that man O’Shea popped up again to give the victory to Beaufort. In the only premier game of the night, the youngsters of Buckleys put it up to Izusi Troopers but couldn’t match the winners’ strength in the heavy conditions. Daithi Casey and Stephen Lehane hit two each but the winner came from the boot of Tim Lynch. The reserve semis saw Dave’s Taxis and Beaufort progress. An o.g. gave Dave’s the lead and try as they may they couldn’t get more. Ian Lynch, Alan O’Brien were very strong in midfield. Dave Leane tried hard for the Granary. Beaufort were comfortable versus Bluebell and had a 5-0 win. Kevin O’ Brien hit a hat trick and Micheal O Sullivan had a brace. The final should be a cracker between two good footballing sides. The Premier reached its penultimate stage last night and served up two great contests. Haircut 100 had a lot of the play throughout against Isuzu Troopers but they couldn’t seem to manage the winner. Isuzu stayed in it thanks in the main to the outstanding Jameson Hughes, while Kenneth Clifford, John McDonagh and Brian Spillane were showing well for Haircut. Two inspired substitutes in the forms of Pat O’ Neill and David Hayes turned the game. In extra time Hayes had a decent chance at the far post but was just shy with his effort. Then O’Neill took it perfectly on the chest and sent it into Hayes’ path. He shot it goal wards and it hit the net off an Isuzu player. Hard luck on Isuzu who held out for a long time but Haircut deserved it based on their lion’s share of the possession. A fancied Leanes side started well against Murphys Boolteens with David Gleeson and Paudie O’Connor having chances early on. Jason “Star” Foley and Paul O’Donoghue were impressive at the back for Murphys and would prove crucial over the course of the game. The first goal came from a “Gaffer” penalty and it took Leanes until the second half to equalise, courtesy of a belter of free kick from O’Connor after O’Reilly was fouled. “Star” was the man again for the second when his searching free kick went all the way to the net after a mix up in the Leanes box. It looked like curtains for Leanes but the never-say-die O’Connor and O’Reilly combined again to send the game into extra time. 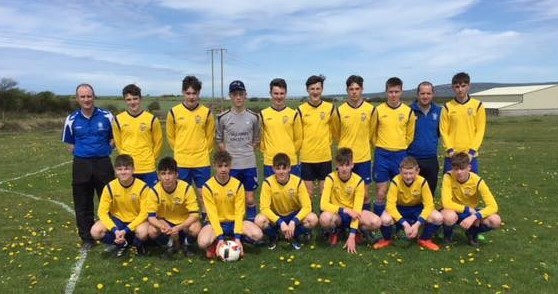 Paul Lynch and Nicholas Murphy gave it their all for Leanes but Boolteens had enough in the tank to finish them off on penos. So it’s Haircut 100 and Murphys Boolteens in the final at on Wednesday and we’re expecting a real war of attrition! Tonight we have the Ladies Cup Final between Pages Bookstore and Charlie’s Angels at 7pm followed by the Reserve Cup Final between Dave’s Taxis and The Beaufort Bar. It should be a great night’s soccer-all the better if the weather holds! This game looked as if it would be a mismatch when Pages arrived with only six players having lost two to injury the previous evening. Charlie’s duly took the lead through the ever-dangerous Louise McCarthy who was capable of scoring from anywhere. Laura Buckley and Lorraine Foran regained some composure after this upset and it was Buckley who got Pages back into the game. She collected the ball close to the halfway line and hit a looping shot with her accurate left leg to beat Charlie’s keeper Marie Cahillane. Undeterred, Charlie’s regained the lead before half time when Joanne Spillane got the first of an impressive hat trick to leave it 2-1 to Charlie’s at the break. The second half was an even contest at first and Una O’Mahony gave Pages a chance when she won the ball from Lynn Jones and belted it to the Charlie’s net. Then the “Energiser bunny” Spillane found another gear. Once on the ball, she strongly held off Foran and finished with aplomb. Charlie’s were cruising now and the numbers deficit was affecting the Pages girls. The final blow came after a mix up in the Pages defence and Joanne Spillane took full advantage with a confident finish. Charlie’s were good value for money and it was a super game with many entertaining passages of play. Joanne Spillane received the Player of the Tournament award for her superb displays throughout the competition. Going on form in the semi finals, the Beaufort Bar looked to be a team that would score under any circumstances, while Dave’s had been steadily gaining momentum. The Beaufort boys were in control early on. John Falvey and Kevin O’Brien both had decent chances and it looked to be only a matter of time before they went in front. Dave’s fought back though and Alan O’ Brien and Neilus Hayes were finding their feet in what was becoming a brilliant contest. Then when the ball broke from Joe Joe Fleming, Ian Lynch was there to send it home and put Dave’s in front. O’ Brien inexplicably hit his own bar soon afterwards but it was Dave’s who would score next. A well-worked throw found Timmy Lyne in on goal and he made no mistake. Beaufort had a couple of corners before half time but it stayed 2-0 at the break. Early in the second half, captain Alan O’Brien threaded one through for Joe Joe Fleming and he finished on the turn à la Wayne Rooney. Beaufort never gave up however and Micheal Hallissey got one back. Substitute Denis Pio Moriarty then set up the deadly John Falvey for number two and extra time looked a possibility. Ian Lynch was having none of it though. He ran onto a ball close to the half way line and after a devastating run, he thumped it home to put the result beyond doubt. Michael Hallissey got another back from a penalty but Dave’s had enough to hold on and ran out deserving winners. True to form, we witnessed a cracking contest, with a very high standard of play despite the wet conditions. This game produced a contrast of styles and it was the strength and effort of Beaufort that won the day. Caseys put a few decent passes together in the early stages with Mike Talbot and Ger O’Shea showing well. Mike Kissane gave Beaufort the lead after a prolonged spell of pressure and a titanic goalmouth scramble. Caseys lost their focus for a while and Cormac O’ Shea and Mike Kissane were always a threat for the Beaufort men. The remainder of the half was spoiled by stoppages, as the quality of play deteriorated and the heading talents of Vince Casey came to the fore. Down 1-0 at the break, Caseys showed real intent from the start of the second half and forced five corners in all. Pat O’Neill and Diamuid O’Carroll both had opportunities but John “Curly” O’Connor, Brendan “Breeno” and co. would not be beaten on the night. In an effort to put the game beyond Casey’s reach, Cormac O’ Shea made a great run down the right for Beaufort but the ever-dependable Mike Talbot was there to see him off. A hard fought victory for Beaufort who held out well and looked strong and resolute throughout. The score line perhaps doesn’t do justice to the achievement of the Boolteens men in reaching the Premier final but it does reflect the sheer quality of the Haircut side. It took only 15 seconds for Stephen Hayes to put Haircut in front and they never looked back. After two minutes, Pa McGrath hit the post and it looked like curtains for Murphy’s who were struggling to cope with the slick passing of Haircut. James “Gaffer” Long did nearly make it past the Haircut defensive line but he was denied by Brian Spillane. It was 2-0 when the awesome Gary Keane struck after Stephen Hayes put him through. The game livened up somewhat after this and referee Stuart Templeman had to be vigilant after some stiff challenges went in. David Clifford was another who needed all his faculties, as without him Boolteens would have been in more serious trouble. As it was, they were 3-0 down at the break. Brian Spillane (the subsequent Player of the Tournament for his excellence and consistency throughout the competition), ran onto a pass from Gary Keane and planted a super shot into the Murphy’s net. The “Gaffer” gave it everything in the second half and Jason “Star” Foley even had a stint up front but Murphy’s couldn’t get past David Hayes and John McDonagh who were the essence of composure on the night. Kenneth Clifford finished the game off with a cool finish close to the end. So it ended, 4-0 to Haircut 100 and Pat O’Neill who claimed yet another Premier trophy. 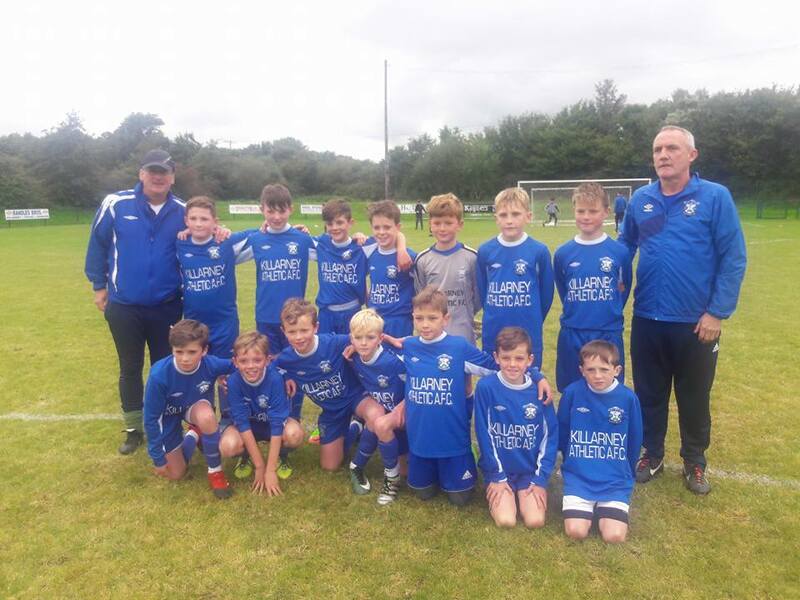 Murphy’s met a team in serious form and it certainly augurs well for Killarney Celtic’s drive to retain the K.D.L League trophy.